Cranston, RI – The Cranston Reds Sin Bin officially closed last night as Rhode Island’s only Junior B team took to the ice at the Cranston Vets Memorial Ice Arena. The emergency detachment of team members into battle, significantly shortened the Reds bench during the third period. The Reds in true Junior B fashion, filled the bin to the brim, taking on the first seed Boston Bandits in their last game of the season and final skate as a Metropolitan Junior Hockey League (MJHL) team. The on-ice battle heated up quickly with players nurturing seasoned personality conflicts and getting one last shot at “healing” open wounds. Known to this hockey community as a typical Friday night hockey scrum, the evening’s activities were blown out of proportion, drawing the attention of a full contingent of local law enforcement. 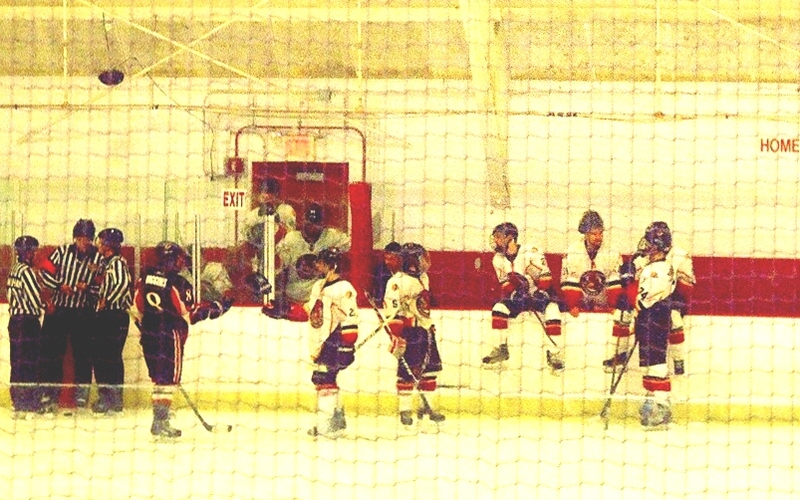 Arriving after the on-ice conflict ended, several officers from the Cranston Police Department appeared on the scene. No less than eight Cranston Police Department cruisers were on hand, continuing to arrive well and remain on scene until after the game ended. Lt. Alan Loiselle was at the rink. Attempts to reach the Mayor’s office for comment went unreturned. Full story, photos and video coming up. This story was updated on 3/11/2014 at 6:11 pm. ← Copycat or Copyright? When creative license comes too close for comfort.